4 days to Roubaix: The correct answer is "elastomer"
That's a whole lotta technology on Greg's bike in the above scan. Early SRM power meter, Mavic Zap shifters. 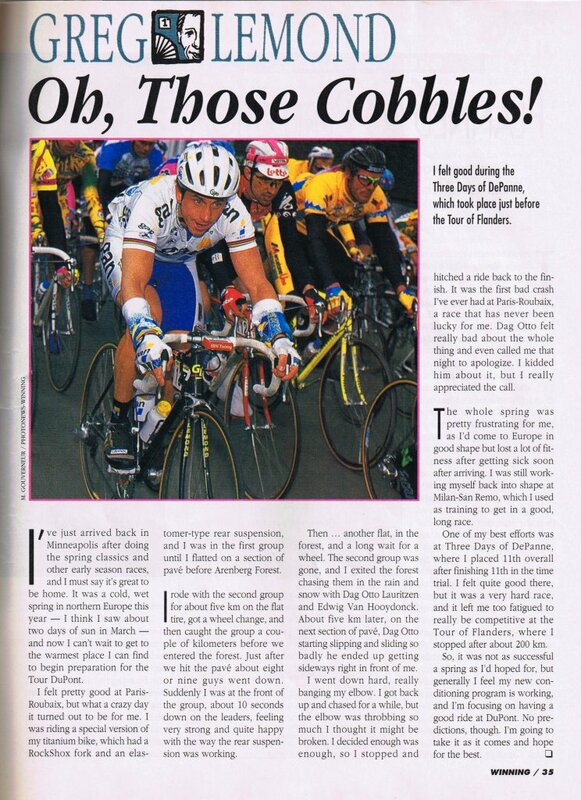 Most riders don't care what they ride, but Lemond definitely was the bike geek's racer - he was more willing to try out some of the new technologies that were beginning to emerge, even if some of those technologies, like electronic shifting, are only just becoming viable today. MERCKX TEAM COLOR SCHEME ALERT: The Lotto rider between Lemond and Cipo is riding a Caloi - which is really an relabeled Merckx. Different color scheme that I'd previously documented - guess I was right when I said there was a Lotto scheme I was missing. Caloi also sponsored Motorola about that time - 1992-1993 sometime. Those were also relabeled Merckx bikes.